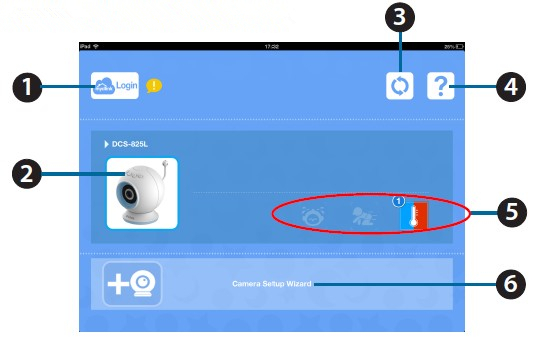 At any time after you complete the Setup Wizard, you may tap on the Live View screen to access the Configuration menu. The configuration icon is in the upper right corner of the screen. Once the setup process is complete, you will see the mydlink Baby App Home Screen. 1 Login Tap on the mydlink Login icon to remotely access your DCS-825L. 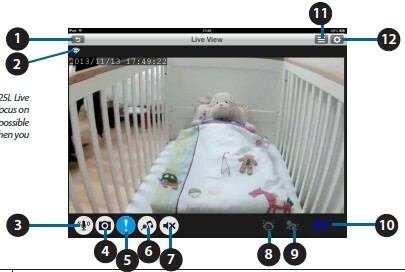 2 DCS-825L Tap on the Wi-Fi Baby Camera image to access Live View. 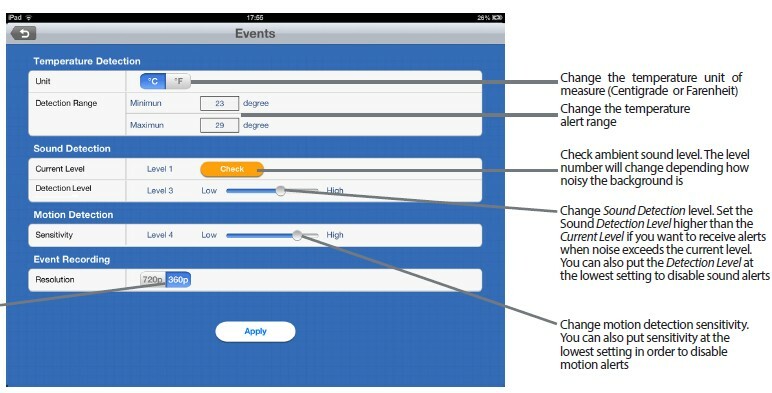 Refer to “mydlink Baby App Live View” on page 26. 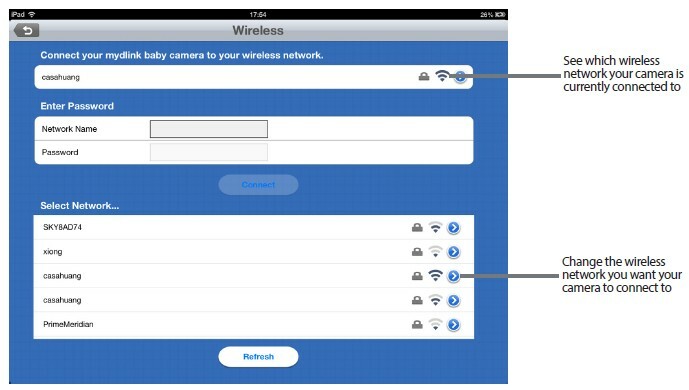 3 Refresh Tap on the Refresh icon to scan for Wi-Fi Baby Cameras on your network that have not yet been added to the app. 4 ? Tap on the Question Mark icon for FAQs. 6 Camera Setup Wizard Tap on Camera Setup Wizard to set up an additional DCS-825L. 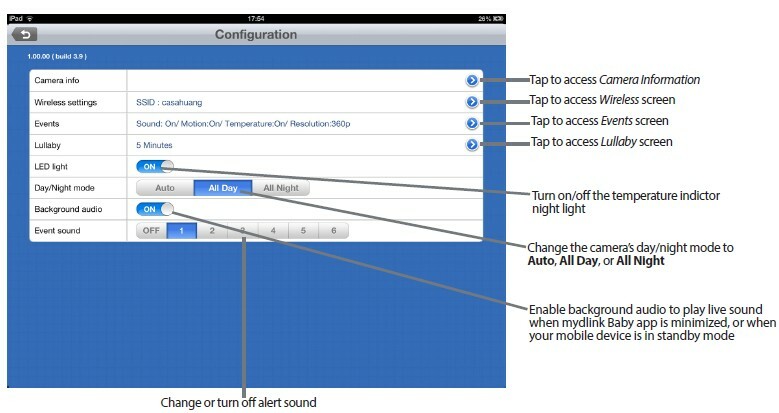 At any time, you may tap on the Live View screen to return to the Home screen, and to access the Settings and Configuration menus. Icon descriptions below. Note: The first time you access your D-Link DCS-825L Live View, you will get a reminder to adjust the focus on the camera. This will ensure you get the best possible image. You only need to do this once, and then you can turn off the reminder. 1. Return Tap on the Return icon to return to the Home screen . 3. Microphone Tap on the Microphone icon to enable or disable two-way audio. 4. Camera Tap on the Camera icon to access snapshot, video recording, and playback mode. 5. ! Tap on the Exclamation Point to enable or disable alert notification. 6. 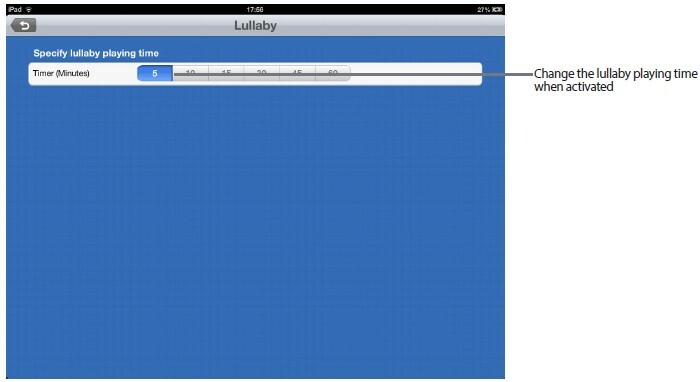 Music Tap on the Music icon to select from the five available lullabies to play on your camera’s speaker. Also is used to enable or disable the music. 7. Speaker Tap on the Speaker icon to enable or disable Live View audio. Volume can be controlled by using the volume buttons on the mobile device. 8. Sound Alert Notification of sound, like the sound of a baby crying. 9. Motion Alert Notification of motion, such as when the baby is moving. 10. Current Temperature Displays the current temperature.